“Octopus: Most Intelligent Animal on Earth” is a documentary from Germany in the AMChannel series on YouTube about animal capabilities. The German title (the film is narrated in English) is “Master of the Deep”. The film shows progressive experiments, in Italy and California, to test the ability of the octopus to solve problems getting food, learn and remember mazes, and learn from comrades. The life span is very short , about 4 years, and the female starves herself to death after laying her eggs as she incubates them. There is some evidence that the octopus can accumulate knowledge from peers, although they are not taught by their mothers. 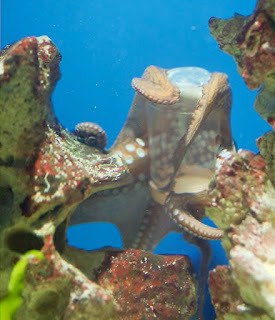 Octopuses can also move on land between bodies of water for short periods of time. The octopus has a central brain, and then each arm has a sub-brain (although humans and mammals have something comparable with the automatic nervous system and reflexes – the octopus nervous system is still decentralized). It sounds plausible that the octopus has a structure comparable to a vertebrate pineal gland, supposedly responsible for sentience. The film shows the “learning” in the skin’s chromatophores – comparable to growing tattoos, or shedding and immediately replacing hair. Cephalopods went their own way about 600 million years ago when vertebrates develop. They present the idea of convergent evolution. Consciousness has more than one way to develop or be mapped onto different kinds of nervous systems. The octopus is thought to have about the intelligence of a dog or cat, and will learn to recognize humans, understanding we are sentient like them even if our bodies are very different. Theoretically, because the octopus can move on land, it could evolve into a civilizing animal – but it would need to develop a “family” structure to raise and train the young. Maybe alien planets do have civilizations developed from invertebrates like these.